Olympics • Slowed by a bad cold, he finishes 14th out of 15. 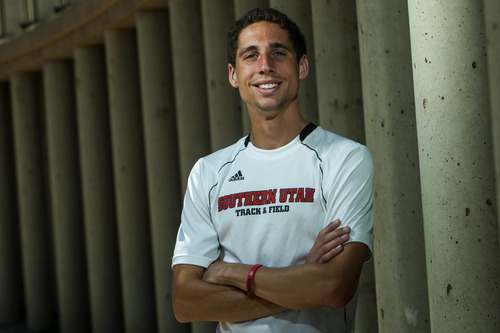 Chris Detrick | The Salt Lake Tribune Southern Utah University senior Cam Levins poses for a portrait Tuesday May 29, 2012. Levins is an aspiring Olympic runner for Canada. London • Next time you feel as if you've been struck by a cold or flu at just the worst possible time, think of Cam Levins. He was hit at the London Olympics. The Southern Utah University track star said he became ill after his first race here last week, and could not shake it off in time to perform his best for his native Canada on Saturday in what is usually his best event, the 5,000 meters. Instead, he lagged at the back of the pack the whole way, and finished 14th in a 15-man field to conclude an otherwise amazing season in which he unexpectedly became a two-time NCAA champion and burst onto the international scene. "Just a bad cold that's moved down into my chest, my lungs," he said, "and you kind of need those to run well." Great Britain's Mo Farah won a race that started at a jog but ended with a dazzling sprint down the homestretch, with 80,000 fans going mad for Farah, who held off Ethiopia's Dejen Gebremeskel to become the sixth man to win gold in both distance races at the same Olympics. "It's unbelievable," he said, after dropping to the track to perform sit-ups in celebration. Farah clocked 13 minutes and 41.66, while American Bernard Lagat finished fourth in 13:42.99 and countryman Galen Rupp  the silver medalist behind training partner Farah in the 10,000  was seventh in 13:45.04. Levins came home in 13:51.87, far off the personal-best 13.18.29 that he ran in the semifinal of the event on Wednesday. He said that he'd started to get sick by then, but it didn't affect him until afterward. "I hate making excuses," he said, "but I just didn't feel like myself at all when I started." Known for his unusually high-mileage training regiment, Levins said he became sick after coming in contact with a member of the Canadian staff  he didn't want to name names  after his 11th-place finish in the 10,000 last Sunday. "The next day they got sick, and then the day after that, I got sick," he said. Doctors tried to treat him with antibiotics, he said, which they hoped would not affect him in the race. But Levins said he just never felt like himself, and couldn't muster anything once the race really picked up. "It didn't feel good straight away," he said. "Hit the last lap and … it was just sad. I couldn't move. I lost, sort of, motivations. "I was glad I was still there even on the last lap," he added. "Didn't feel good today, and you know, that's part of it. It happens. I just wish I could have had a better performance." His fans in Cedar City are bound to be proud of him just the same, having gathered in a university auditorium on campus to watch him race. Levins said he's headed back to SUU as a volunteer coach, but he doesn't know when. If he can recover quickly, he hopes to race a few times around Europe. Otherwise, he'll be headed home sooner. At the very least, he leaves with personal records in both of his events, after saying before the Games that his only goal was to make the final of the 5,000. "I'm very happy to at least leave the Olympics with a personal best in my events," he said. "I'm a little sad that my final didn't go the way I wanted it to. … I just need to keep working harder each year and try to rise up to the level of these other athletes."